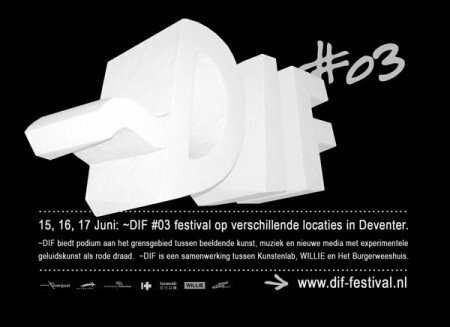 15th of June, 21.30: ~DIF#03 festival @ WILLIE in Deventer, with Sonic Wargame (live), Thomas brinkmann (live), TBA / Natalie Beridze (live), Jos Smolders & Jac van Bussel (live), Viezeverza & DB (live), Anne Bakker (live) and Radion (dj). 16th of June, 23.00: ~DIF#03 festival @ Het Burgerweeshuis in Deventer, with About (live), Jason Forrest aka Donna Summer (dj), Cette Truc (dj) and The Sub-Post-It’s (performance). 17th of June, 16.00: ~DIF#03 festival @ Het Kunstenlab in Deventer, with The Draining (live), Karel van der Eijk (live), C3 (live) and Quinten Dierick.